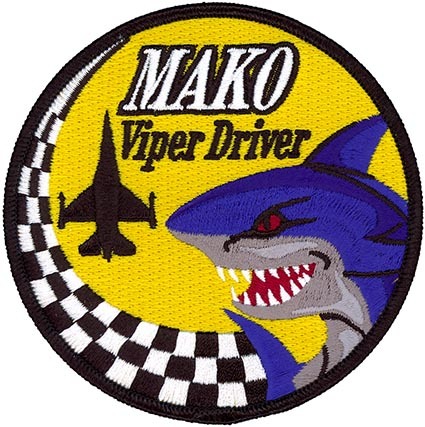 SKU: FS-93-1122 Categories: USAF INSIGNIA, FIGHTER, SQUADRONS - 53-95 Tags: 482nd Fighter Wing, 482nd Operations Group, 93rd Fighter Squadron, FL, fully combat-ready unit, General Dynamics F-16C/D Fighting Falcon, Homestead ARS, Makos, mission ready pilots, multi-purpose fighter aircraft, USAF Patch, worldwide deployment. Lineage. Constituted as 93 Troop Carrier Squadron on 14 May 1943. Activated on 1 Jun 1943. Inactivated on 10 Jun 1946. Redesignated as 93 Troop Carrier Squadron, Medium on 19 May 1949. Activated in the Reserve on 27 Jun 1949. Ordered to Active Service on 1 Apr 1951. Inactivated on 3 Apr 1951. Redesignated as 93 Fighter-Bomber Squadron on 26 May 1952. Activated in the Reserve on 15 Jun 1952. Inactivated on 16 Nov 1957. Redesignated as 93 Tactical Fighter Squadron on 23 Feb 1978. Activated in the Reserve on 1 Oct 1978. Redesignated as 93 Fighter Squadron on 1 Feb 1992. Assignments. 439 Troop Carrier Group, 1 Jun 1943-10 Jun 1946. 439 Troop Carrier Group, 27 Jun 1949-3 Apr 1951. 439 Fighter-Bomber Group, 15 Jun 1952-16 Nov 1957. 915 Tactical Fighter Group, 1 Oct 1978; 482 Tactical Fighter (later, 482 Fighter) Wing, 1 Apr 1981; 482 Operations Group, 1 Aug 1992-. Stations. Alliance AAFld, NE, 1 Jun 1943; Sedalia AAFld, MO, 15 Jun 1943; Alliance AAFld, NE, 2 Aug 1943; Laurinburg-Maxton AAB, NC, 19 Dec 1943; Baer Field, IN, 1-12 Feb 1944; Balderton, England, 6 Mar 1944; Upottery, England, 26 Apr 1944 (operated from Ramsbury, England, 7-16 Aug 1944 and Membury, England, 16-22 Aug 1944); Juvincourt, France, 8 Sep 1944; Lonray, France, 30 Sep 1944; Chateaudun, France, 4 Nov 1944-Jul 1945; Baer Field, IN, 17 Sep 1945; Sedalia AAFld, MO, 7 Oct 1945-10 Jun 1946. Selfridge AFB, MI, 27 Jun 1949-3 Apr 1951. Selfridge AFB, MI, 15 Jun 1952-16 Nov 1957. Homestead AFB (later, Homestead ARS), FL, 1 Oct 1978- (operated from Wright-Patterson AFB, OH, Sep-Dec 1992 and from MacDill AFB, FL, Feb 1993-Mar 1994). Aircraft. Principally C-47, 1943-1945 and C-46, 1945-1946. C-46, 1949-1951. F-51, 1952-1953; F-80, 1953-1956; F-84, 1956-1957. F-4, 1978-1989; F-16, 1989-. Operations. Airborne assaults on Normandy, Holland, and Germany; relief of Bastogne; transportation of personnel and cargo in European Theater of Operations (ETO) during World War II. Trained in troop carrier operations, 1949-1951 and fighter-bomber operations, 1952-1957. Since 1978, trained to maintain combat readiness in tactical fighter operations. Periodically deployed to Turkey to enforce the no-fly zone over northern Iraq, 1997, 1999 and 2000. Supported Operation Enduring Freedom, 2001; Operation Iraqi Freedom, 2007 and 2009. Campaign Streamers. World War II: Normandy; Northern France; Rhineland, Ardennes-Alsace; Central Europe. Decorations. Distinguished Unit Citation: France, [6-7] Jun 1944. Air Force Outstanding Unit Awards: 1 Jul 1981-5 Oct 1982; 1 Jan 1989-31 Jul 1990; 2 Oct 1991-1 Oct 1993; 1 Nov 1993-30 Aug 1995; 1 Oct 1999-30 Sep 2001; 1 Oct 2004-30 Sep 2006; 1 Oct 2006-30 Sep 2008; 1 Oct 2008-30 Sep 2009; 1 Oct 2009-30 Sep 2010. French Croix de Guerre with Palm: [6-7] Jun 1944. Emblem. Approved on 11 Jun 1979; newest rendition approved on 10 Sep 2009.